Oral hygiene is an often-overlooked but important factor in your dog's overall health. If he has a toothache or sore gums, he's dealing with pain and stress that you may not even know about. Left untreated, bacteria introduced by the problem can enter the bloodstream and affect his heart, kidneys or liver. Veterinarians report that an estimated 85 percent of dogs over age 4 are suffering from some form of periodontal disease, a painful oral condition that can lead to tooth loss and infection. The good news? All of these problems are preventable with regular dental cleanings and professional checkups. 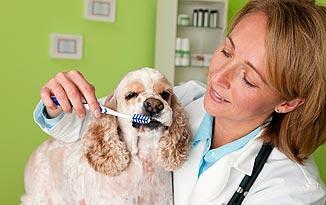 Like regular grooming or the daily jaunt outside, dental care should be something your dog comes to expect each day. But it won't happen overnight; most dogs take some time getting used to someone poking around in their mouth. Most owners need to warm up to the idea, too! Ideally, introduce dental care when your pooch is still a puppy. But don't stress if you just realized that your adult dog's teeth need some attention. Just take a slow, patient approach, and remember that lots of love and treats go a long way in winning him over. Most experts agree that daily brushing is ideal, but if that's unrealistic, aim for three to four times per week. And don't be an overachiever: If your pup's patience only lasts for you to brush half his teeth today and the other half tomorrow, that's fine. Just remember which half you did each day! Next up, we'll tell you what products you'll need and how your dog can help clean his teeth without even knowing it.